After reading up on the issue, and listening to Mayor Allender's presentation, I have decided to support the new Civic Center. My only question now is, would that money be better spent getting the railroad out of town and fixing our roads? But I think now those issues are separate. We have to spend money one way or the other on the civic center. We may as well build something now that will be viable for many years to come instead of trying to coax the old civic center into years beyond its ability. 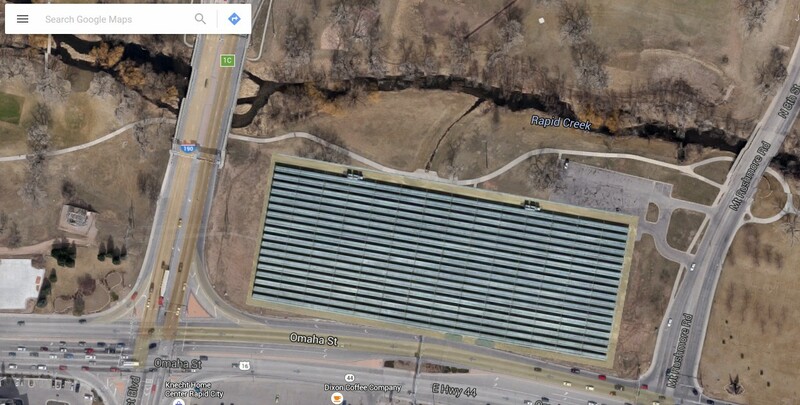 I'd like to propose a use for the city property on the northwest corner of Omaha Street and Mt. Rushmore Road. 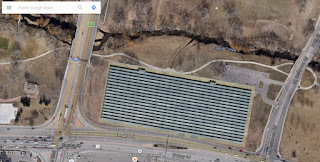 I would propose that the city build a solar panel farm there that would provide power to the Central High School, and perhaps even to the Civic Center. * make an economical use of the property, since it would be providing "free" electricity to the high school once its' paid for. * provide vocational training for high school students who will learn how their school is powered. * be relatively cheap because the land is already city-owned, and the power line to the high school would be quite short. * indicate that Rapid City is a city that is keeping up with technology and is environmentally aware. I do not know the actual technical nor economic details other than the above. Attached is an overlay of the property with solar panels from a solar farm in Arizona. If you would like more information about this idea please feel free to contact me and I can make a more detailed report. Why didn't the Civic Center just make it harder for the scalpers to grab all the tickets? Maybe they need to spend a little on a software upgrade? "NORTHERN HILLS — When it comes to education spending, South Dakota is definitely in a slump and has been for quite some time. As a result, local school districts struggle to keep programming alive and teacher salaries competitive. According to U.S. Census Bureau data assessed recently by the Black Hills Knowledge Network, South Dakota spends about a third less than neighboring states on education as a proportion of personal income. Already last in the nation for teacher pay, South Dakota also ranked last regionally and 47th nationally in 2012 for its spending on K-12 education as a proportion of personal income, according to the most recent U.S. Census data available. " This is ridiculous. Education is hugely important for every aspect of a person's life and for a community. We are hurting ourselves by pretending that taxes are evil or whatever. "According to a news release from the district, the linchpin of the deal is an agreement to divert $4 million in capital outlay funds toward general fund expenses, and then use the freed-up $4 million in the general fund to raise teacher pay. The budget maneuver is allowed by a state law that was adopted in 2009 and was supposed to sunset in 2012 but has since been renewed through 2018." This is where our money should go first.